You know those things that people tell you to do and you never do. "It won't happen to me?" "I will do it tomorrow." "Is that really going to help?" I am pretty well versed in that "tomorrow" philosophy. Now, I am not a firefighter, I have no special knowledge of fighting or preventing fires. realized how important it is to have in my own home. even though it had been suggested numerous times by firefighter friends. This summer I discovered why having a fire extinguisher in your home is so important. While at a party, we all noticed the lights start to flicker, and then heard the kids yell "Fire" and coming running out of the playroom. There were moments of disbelief, confusion, panic...and action. The fire was caused by a surge in power due to a faulty ground wire on the outside lines...it surged through the house (remember I am no professional...these are my simple words) and caught a surge protector on fire. The fire was small, and the kids were quick to respond and let us know there was a problem, and luckily these homeowners were very smart...they had a fire extinguisher in their home and it was easily accessible. While someone else called 911, the home owner was able to grab the fire extinguisher and rush into the playroom and put the fire out. 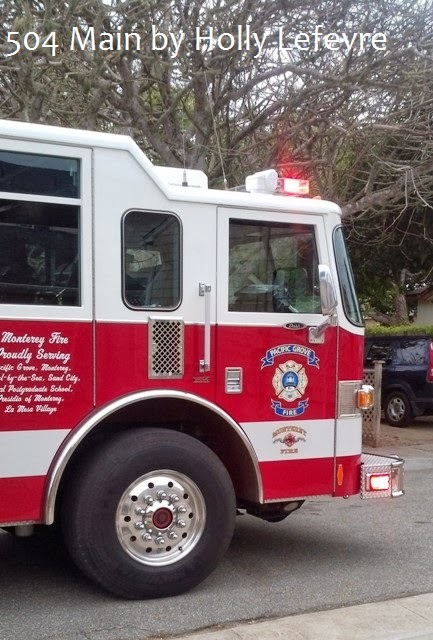 A simple home fire extinguisher was responsible for stopping that fire and saving the house. So, do you know what I went out and purchased the next day...a fire extinguisher. It was only $15.00! After this experience it made me wonder why I had taken so long to purchase this important and really inexpensive piece of fire safety equipment. These fire extinguishers are available at hardware and home improvement stores and while hopefully I will never need to use mine, I have a certain piece of mind knowing I now have it. Check your smoke and carbon monoxide detectors regularly. I believe many suggest doing it when you change the clocks (which is coming up!). Have a safety and escape plan in case there is a problem in your own home. Be sure everyone in your family (especially the kids)know what to do in case of an emergency like this. PLEASE READ THROUGH THE COMMENTS - READERS HAVE GREAT TIPS TOO! 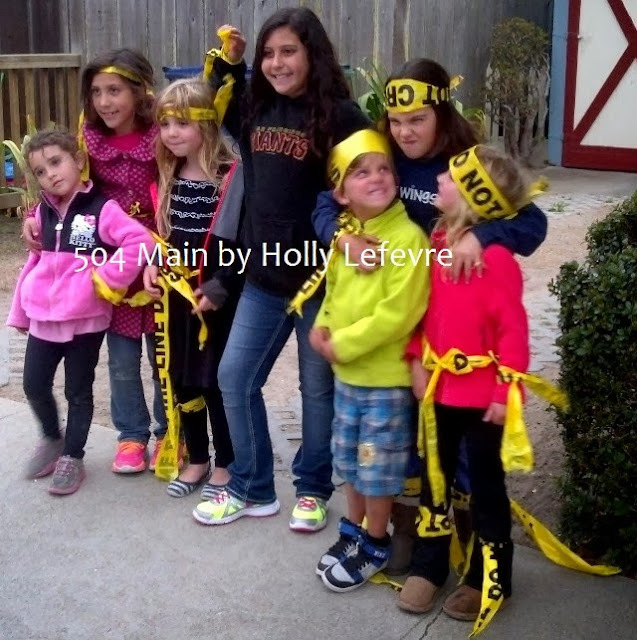 This photo was taken after the "caution tape" came down. These kiddos enjoyed a "lighter" moment. But please do not think they did not learn a very important lesson that day and each parent that was at this party has used this as a teaching tool. Do you have any FIRE SAFETY tips? 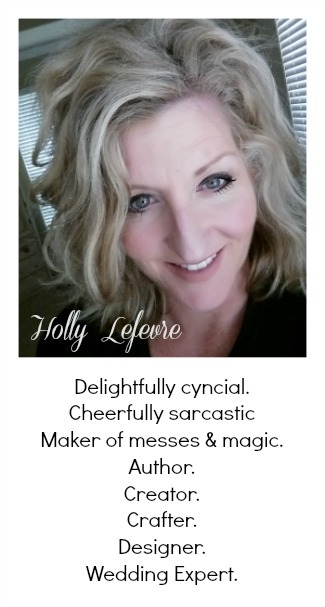 We have two and thankfully have never had to use them but I would possibly pray it the wrong way-- yep I just admitted that. When I bought my house I had two.......one in the kitchen and one in the garage. They have since gone bad and need to be replaced so your post served as a nice reminder! 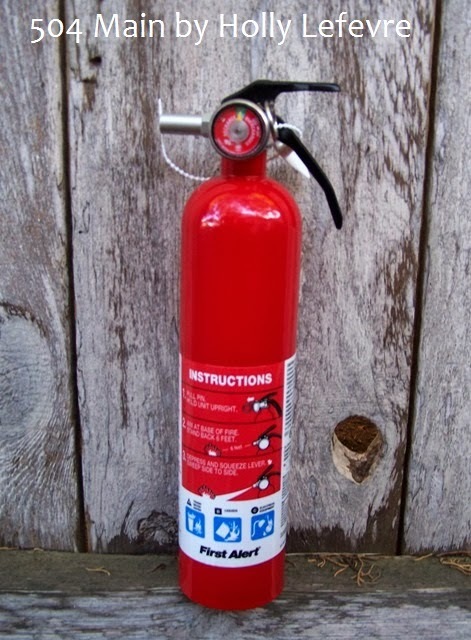 4) Make sure you have the right type of extinguisher. There are different types for different types of fires and some are actually worse to use on certain types of fires (oil, electrical, etc.) than nothing at all. So true! Thanks for the reminder. My neighbors house caught on fire and I haven't replaced mine. Couldn't save the house but we were able to keep it at bay til the fire dept got there. I totally agree -- we should all have at least one. The most important thing is to call 911 and get out, but an extinguisher can buy precious minutes for your family. My biggest tip (and biggest pet peave when I see design bloggers do this) is to never, ever, ever remove the gypsum from sleeping room walls to expose wood boards in older homes. The drywall can buy your family members up to thirty minutes to get out of the house. I am a fire survivor, and have a sibling who perished in a fire, so this is pretty real to me. Other tips would be not to hang curtains made from acrylic fibers, and to think about where you place candles (and acrylic is actually drawn toward a flame). Very good tips... I need to get on this. Thanks for the reminder. Very important stuff. 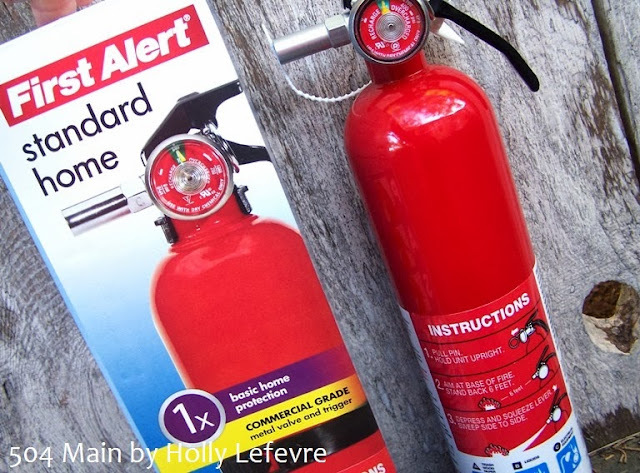 This is a great reminder Holly - I need to replace my kitchen fire extinguisher! I'm glad everyone was ok at your house! !